Gingrich denies special treatment from Tiffany & Co.
Newt Gingrich on Wednesday denied that he and his wife were granted special treatment by Tiffany & Co. in acquiring a line of credit with the company. The denial comes in the wake of the revelation that the congressional committee at which his wife worked when the loan was extended was being heavily lobbied by the prominent jewelry company. Gingrich took heat last week when it was revealed that he and his wife had between 2005 and 2006 incurred from $250,001 and $500,000 of debt with Tiffany & Co. In an appearance on CBS' "Face the Nation" Sunday, Gingrich insisted that he and his wife had held a "standard, no-interest" account with the company and that "it's a normal way of doing business." 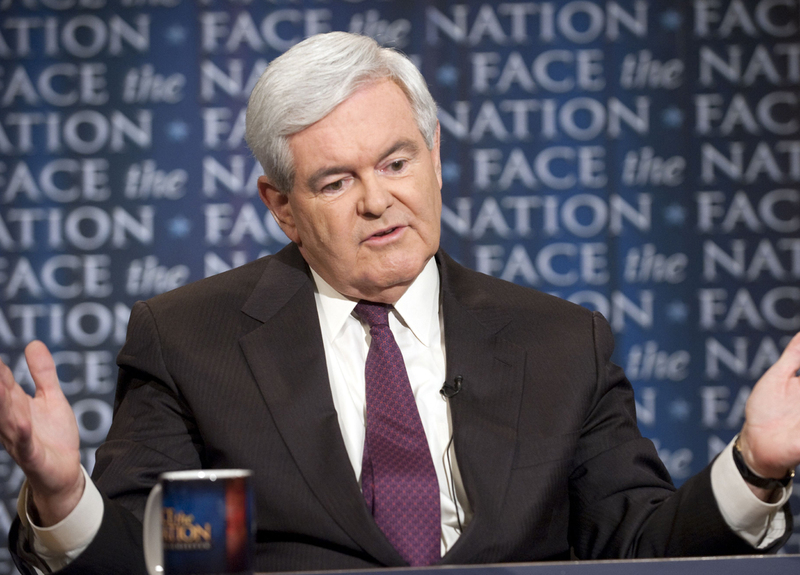 "We're private citizens," Gingrich told host Bob Schieffer when asked about the expenses. "I work very hard. We have a reasonably good income. I currently owe nothing, except I owe one mortgage on a house that's rental property in Wisconsin. Everything else is totally paid for. My home is paid for. My cars are paid for. We don't have a second house. We don't do elaborate things." On Wednesday, the blog Spy Talk noted that the House Agriculture Committee, on which Gingrich's wife Callista was at the time serving as "chief clerk," was being lobbied by Tiffany & Co. during the time the Gingriches incurred the debt. "Tiffany's annual lobbying expenditures rose from about $100,000 to $360,000 between 2005 and 2009, according to records assembled by the Center for Responsive Politics, a nonpartisan government watchdog organization," wrote Spy Talk's Jeff Stein. A Gingrich aide insisted on Wednesday that the former House Speaker's account with Tiffany was entirely legal and that the couple got no preferred treatment due to political status. "They didn't get a special deal," the aide told CBS News. "They got [an] interest free loan for 12 months. Not a special deal. Tiffany's gives out 12-month interest free financing for purchases over $5,000 or any engagement ring over $1000. That's just their policy and the Gingrich's took advantage of that deal." Tiffany & Co. said in a statement to CBS News Wednesday that in addition to the standard revolving credit card agreement, which charges state-specified interest rates, the company also offers a so-called Tiffany Time Account, which "offers interest-free borrowing for up to one year for credit-worthy Tiffany customers." "To meet competitive conditions, Tiffany makes Time Accounts available to revolving credit card customers who wish to purchase engagement rings over $1,000 or other merchandise valued over $5,000," says the statement. "On a transactional basis, this program offers interest-free borrowing for up to one year for credit-worthy Tiffany customers." Tiffany did not respond to a request for comment about the eligibility requirements of an appropriately "credit-worthy customer" or what it meant by "competitive conditions." The company noted that, while all customer information was confidential, Gingrich had given it permission to "confirm that [Gingrich's] Tiffany Time Account has a zero balance and that all payments were made in a timely manner." The Time Account specifies that debts incurred with the account be paid off within the year; Gingrich listed debts with Tiffany for two consecutive years. Gingrich's aide said that the debt did not carry over to a second year, but that debts listed in the second year represented separate purchases. "They made all payment[s] in [a] timely way so paid no interest," the aide said in an email. "They paid off in 12 months. The reason it shows up in two subsequent years is because they were different purchases." Regardless of the details, the damage to Gingrich's campaign may have already been done: For a self-proclaimed fiscal conservative who claims to live a "very frugal" life, the disclosure of a lavish jewelry habit doesn't play well. The revelation has already been compared to John Edwards' now-infamous $400 haircut and the $150,000 worth of clothing bought for Sarah Palin during the 2008 campaign. Gingrich has been roundly mocked for the debt in the week since it was originally reported: Time recently published a playful slideshow speculating on the possible contents of Callista Gingrich's "Tiffany Trove." And Comedy Central's Stephen Colbert tied the Tiffany report to Gingrich's history of infidelity. "Five hundred thousand at Tiffany's?" Colbert said on his show. "There's a simple explanation. The guy clearly buys his engagement rings in bulk."